Having laminate flooring, double panel radiator, stairs to first floor landing, ceiling light point and doors to lounge/diner and kitchen. Dual Aspect - Having feature fire surround with inset gas fire, laminate flooring, single panel radiator, two ceiling light points and double doors to rear garden. Rear Facing - 'L' shaped design and fitted with range of wall and base units with work surfaces over, inset sink unit, courtesy tiling, built in electric oven with induction hob over and chimney canopy above, plumbing for washing machine, single panel radiator, tiled floor, recessed ceiling lights and doors to side passage and rear garden. Providing useful storage with space for fridge freezer and condensing tumble dryer and having tiled flooring, ceiling light point and door to front. Rear Facing - Having laminate flooring, single panel radiator and ceiling light point. Front Facing - Including stair bulk head, having single panel radiator and ceiling light point. 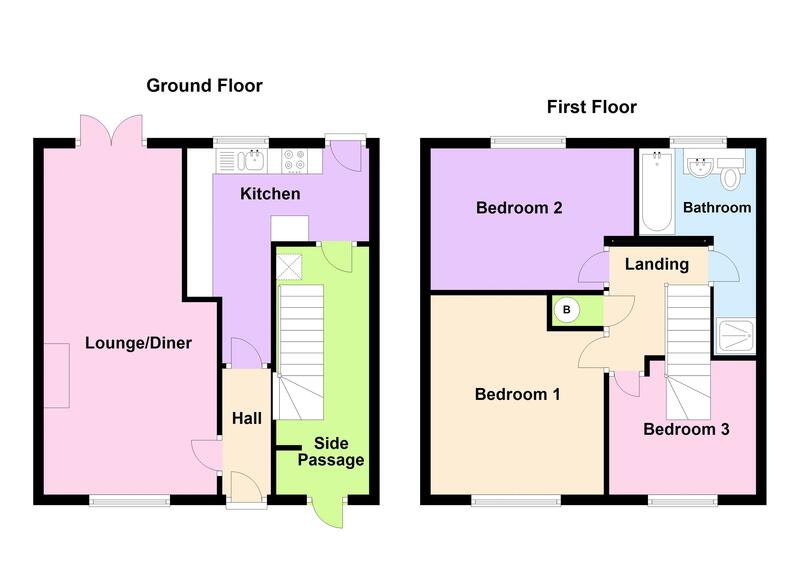 Rear Facing - Having suite comprising paneled bath, separate shower cubicle with mixer shower, integrated wc and wash hand basin with storage, heated towel rail, part tiling to walls, extractor and recessed ceiling lights. Set back from the road with lawned foregarden having central pathway, with communal paring in front. Delightful good sized enclosed gardens with paved patio area and brick store, the remainder being predominantly laid to lawn with further paved sun terrace to the far end with timber store.